Well this weeks New Years weather will remind us thin blood Floridians that in can be down right cold here. I will have to say that it will be tough fishing for the time being but if you have to go this is what I would do. Getting on the water early will not do anyone no good so stop and eat some breakfast first. Live shrimp is the next stop if they can be found. ( call ahead ) River fishing will lend the best action, start at the mid point of the Crystal River or Homosassa and work towards the east until you find biting fish. This may not happen until an angler meets the warm fresh waters flowing from the springs. Warm water means life and survival during extreme cold conditions. Shrimp on the bottom might get the bite and possible suspending plugs in deeper water as well as jigs. Offshore I would believe the sheepshead bite should be starting although I would recommend waiting until better weather. One other option is bank fish. Citrus County has many options on the west side to cast a line without launching a boat. Homosassa has a few spots and down Mason Creek. Going north is Ozello Trail, Ft. Island Trail, the Barge Canal and on the other side try the Follow That Dream road way. Good thing about bank fishing is a warm vehicle is not to far away. Incoming high tide will be early morning or late evening this weekend. The 2017 bay scallop season for Dixie County and parts of Taylor County will be open from June 16 through Sept. 10. This includes all state waters from the Suwannee River through the Fenholloway River. These changes are for 2017 only and are an opportunity to explore regionally-specific bay scallop seasons. These changes were discussed at the Florida Fish and Wildlife Conservation Commission (FWC) meeting on Feb. 8, where staff was directed to work with local community leaders on selecting potential 2017 season dates and to adopt changes by executive order. At the Feb. 8 meeting, staff also updated the Commission on the status of bay scallops in St. Joseph Bay in Gulf County, and set a July 25 through Sept. 10 recreational bay scallop season off Gulf County, including all waters in St. Joseph Bay and those west of St. Vincent Island in Franklin County, through the Mexico Beach Canal in Bay County. All other portions of the bay scallop harvest zone will be open from July 1 through Sept. 24. This includes all state waters from the Pasco-Hernando county line to the Suwannee River Alligator Pass Daybeacon 4 in Levy County and from north and west of Rock Island near the mouth of the Fenholloway River in Taylor County through the westernmost point of St. Vincent Island in Franklin County. 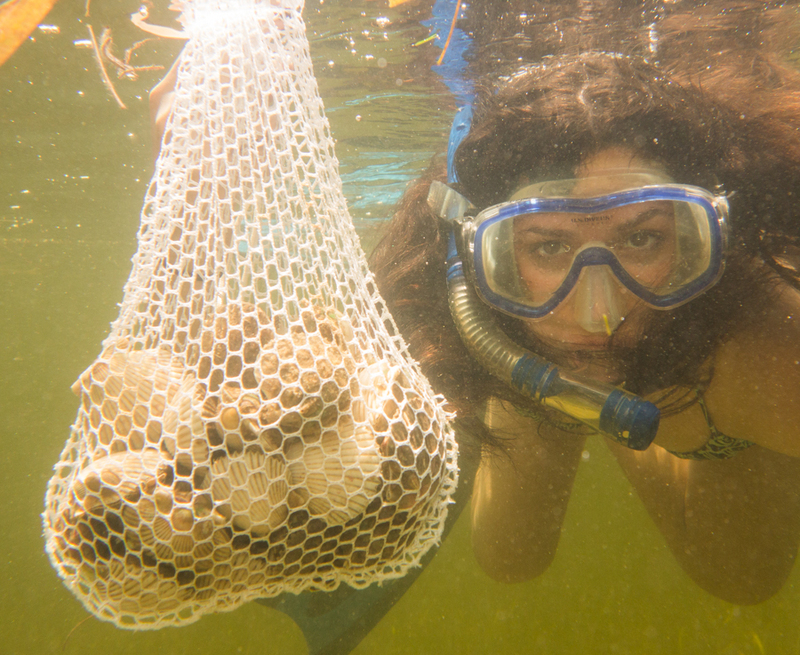 Bag and vessel limits throughout the entire bay scallop harvest zone will be 2 gallons whole bay scallops in shell or 1 pint of bay scallop meat per person, with a maximum of 10 gallons of whole bay scallops in shell or 1/2 gallon bay scallop meat per vessel. Some Excellent Rye Whiskey–From The Backwoods of Florida’s Adventure Coast? Wild Buck Whiskey is all about Natalie and Kevin Goff’s excellence in small-batch whiskey making! The backwoods between Weeki Wachee and Chassahowitzka are mostly known by folks visiting the 31,000 acre National Wildlife Preserve in hopes of spotting a Whooping Crane or a manatee. This Preserve is huge, and the general impression, at least to passers-by, is that there’s no “civilization” west of US19. That’s not the case, especially in terms of whiskey-making! Historically, I suspect that lots of whiskey was made in these woods. Of course, it wasn’t done so legally. However, Kevin and Natalie Goff, owners of Wild Buck Whiskey, are operating their “still”, adhering to all the rules set forth by local, state and federal authorities. The hand-hammered copper still at Wild Buck is where the small batches of whiskey are distilled. It takes lots of love and diligence to make good whiskey, and Kevin and Natalie are dedicated to creating a quality product, in small batches. This is a whiskey made for sipping and just a splash of spring water or an ice cube will bring it to life in your glass. Made from natural ingredients and pure Florida water, their rye whiskey can be found at finer restaurants, bars and liquor stores. But don’t expect to find a case or more than a few bottles at your local retailer as the rye whiskey has been in high demand since winning several awards. And stand by….Wild Buck’s Rum will be available in early 2016. It’s made for sipping, too. So don’t even think Cuba Libre! Natalie and Kevin Goff, escapees from busier parts of Florida, are extremely proud of their products. Don’t Miss A Meal at BeckyJack’s Food Shack in Weeki Wachee, FL! Whether you’re coming back from fishing at Bayport or Hernando Beach, watching the Mermaid Show at Weeki Wachee Spring State Park, or just driving down US19 in Hernando County, a stop at BeckyJack’s Food Shack is a “must”. Yes, the joint is truly a shack, and it’s only open Wednesday thru Sunday (Noon ’til 8PM), but you can expect some excellent food there. The house specialty is the “crunchy fish”, coated in corn flakes and almonds and fried to a golden, crispy finish. If you’re “sorta hungry”, order the sandwich, but if you’re a big eater, try the crunchy fish platter with a side of their famous bean salad. The Crunchy Fish platter is worth the wait–and it’s a bargain at only $9. They’re also famous for their hamburgers and Reubens. The interior at BeckyJack’s is eclectic, fun…and even a bit over the top! Mary’s Fish Camp–A Hernando County Landmark! I’d bet that the number of “legitimate” fish camps in the state of Florida can be counted on the fingers of both my hands. With Florida’s rapid growth and the desire of the tourist and native population for hotels with hot tubs, free breakfast buffets and beach access, the few fish camps with cabins, RV parking, shoreline fishing, and the simpler things in life have been pushed aside in the name of “progress”. When I wrote ” The Saltwater Angler’s Guide to Tampa Bay and Southwest Florida”, I started with a chapter on Hernando County. At that time (2011), Mary’s was one of the few places to stay in the Weeki Wachee/Bayport area that reminded me of the “real Florida”. After the book was published, and after Mary’s death, the place fell into disrepair and was soon closed. Fishing from the seawall at Mary’s is a local tradition–and a bargain at $6 a person! I’m happy to say that Mary’s has been revived and is scheduled to re-open in early October, 2015. With lots of hard work, fond memories, and some cash, several local entrepreneurs are returning Mary’s to its original “glory”. A simple place. A place to relax. A place to fish. The cabins at Mary’s have been updated, with new kitchens and air-conditioning! Mary’s is located at the end of Mary’s Fish Camp Road (where else? ), just off Cortez Blvd, west of US19 in Bayport. The Mud River flows downriver from Mary’s to the Gulf. Along the way, it’s met by the flow of the “famous for mermaids” Weeki Wachee River. And, if you’re wondering why Mary’s Fish Camp is there, it’s simple. There’s great fishing and scalloping just outside the Mud River on the Bayport flats, as well as near the multitude of shallow rocky outcrops that dot the Gulf coastline here. Tarpon Fishing Outfitters–Bigger and Bigger–and Better! I get into Tarpon Fishing Outfitters (on US19 near the intersection of ALT US19 in Tarpon Springs)every month or so and have been delighted to see its growth. When Mr. Lee, of Lee Fisher/Tampa Fishing Outfitters, bought the Tarpon Springs store, the selection was sparse and the place had a “lonely” feel. Now, with the infusion of interest, capital and all those great Lee Fisher and Ohero products, it’s one of the premiere fishing tackle stores on Florida’s west coast. In addition to Lee Fisher cast nets, a full line of Shimano reels, and Yeti coolers, you’ll find Ohero fluorocarbon leader material, Adrena lines, Trident hooks and affordable Ohero rods. Tarpon Fishing Outfitters is also home to one on the best reel repair operations, still known as Dave’s. Most of the fish are hunkered down in the residential canals where the muddy waters are like a blanket for them. Large shrimp is still the best bait to use for these extremely cold months. Their not hitting many artifical baits unless its a very slow retrievel bouncing it off the bottom. Offshore when the weather permits and you can get offshore the fish are biting very good in 55 feet of water or better. The structures in these depths tend to be at least 10 degrees warmer. Cold fronts occur almost twice a week in december which makes water temp cool pretty fast. Redfish, snook and trout will move into residential canals and into back country where there are warm muddy waters. Snook are found up the Cotee river under bridges and docks early in the morning. Redfish and Trout can be found around the mouth of the Cotee river and warm pockets of water around fresh water springs. If you’re looking for a fully stocked bait and tackle shop in Pasco County, be sure to check out Provisions Bait & Tackle, located at 7933 US Hwy 19 in Port Richey. It’s just north of the Cotee River Bridge and is a great source for all sorts of natural and artificial bait, as well as rods, reels and terminal tackle. And they’ve just started stocking some nice fishing kayaks–just perfect for fishing the shallow waters of the nearby Werner-Boyce Salt Springs State Park. Provisions Bait & Tackle is fully stocked and ready to outfit your next fishing adventure. The Saltwater Angler’s Guide to Tampa Bay and Southwest Florida is now available! It’s been a long time coming, but the University Press of Florida has just released my second fishing book. If you’re a native and wanting more information on the Gulf of Mexico coastline from Chassahowitzka to Chokoloskee, you need this book. If you’re planning to winter in Florida, you need this book. Everyone needs this book. The Table of Contents is outlined below. To order, simply click on the link on the sidebar to the right of this page and you’ll be taken to Amazon.com. Thanks–and enjoy!